Our office is continually asked by one group of clients, “what is an arraignment?” We also commonly hear another group of clients refer to their first appearance with an expectation that there will be a trial, with witnesses testifying and the judge evaluating each and every nuance in the evidence. Both groups of clients do not know what an arraignment is. The Point of This Article: An arraignment in a misdemeanor or felony case is not a final disposition of the case on its merits. It is the start of the case, where defense counsel receives the police report and is notified of the charges, however it can be an important opportunity to discuss the case with the prosecution and decide what further action is required, i.e. what evidence must still be provided. An arraignment is a criminal proceeding where the defendant is called before a judge in a court, informed of the charges (either in writing or orally, but usually just in writing) and asked to enter a plea of not guilty, guilty or no contest. When the case is a misdemeanor, the defendant usually does not need to appear, as his or her counsel can appear for that person. There are certain exceptions to this general rule, so it is best to confirm this with your counsel rather than assume that counsel’s appearance suffices. 1) An arraignment was extremely important earlier in time because of the lack of most defendants’ ability to read. During the arraignment hearing the prosecutor or judge would read the charges to the defendant so he understood what he was being charged with and could, in response, decide if he needed to hire an attorney, gather up witnesses and other evidence or simply plead guilty. 2) This process helps to ensure all defendants have appointed an attorney and are prepared before trial. It also gives you the right to discovery of documents in the possession of the prosecution and allows an attorney to advise the client on what to expect going forward in terms of possible punishment, needed work and documents that may help defendant that defendant may be able to provide. 3) During an arraignment, the prosecution may decide if they are going to try your case or not. If you plead guilty during the arraignment then you are sentenced and there is no need for a trial, but if you plead not guilty, further hearings to allow preparation for trial will be set. 4) After the date of the arraignment you have ten days to file motions unless the judge gives you more time, which also makes having an attorney important. We usually extend this time period at the arraignment for you (a waiver of time) as we want you to have time to review and comment upon the police report, the complaint and all other materials the DA, City Attorney or City Prosecutor may provide at the arraignment. While the whole process of an arraignment hearing may seem rather unimportant or purely procedural in nature, it is an extremely critical process and is not to be taken lightly. It is often where first impressions are made and the prosecution reveals its attitude about the seriousness of the charges, a likely plea bargain and the character of the defendant. 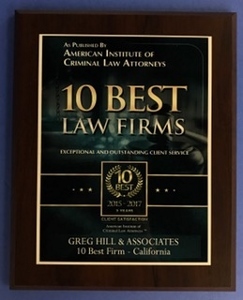 We at Greg Hill & Associates approach each arraignment as an opportunity to discuss the case with the prosecution, establish rapport with the prosecutor handling the case and, if necessary, clarify important facts that the police report may omit or misunderstand. If the prosecution is as familiar with the facts as we are, the arraignment can be a great opportunity to discuss reduction of charges based on the facts, probation, diversion or motions that we might bring to the judge’s attention.